A Tsaachin woman milking a reindeer. On this trip, you'll not only visit the amazing and shrinking world of the reindeer-herding people, the Tsaachin, of northern Mongolia, but will help them and their culture survive. 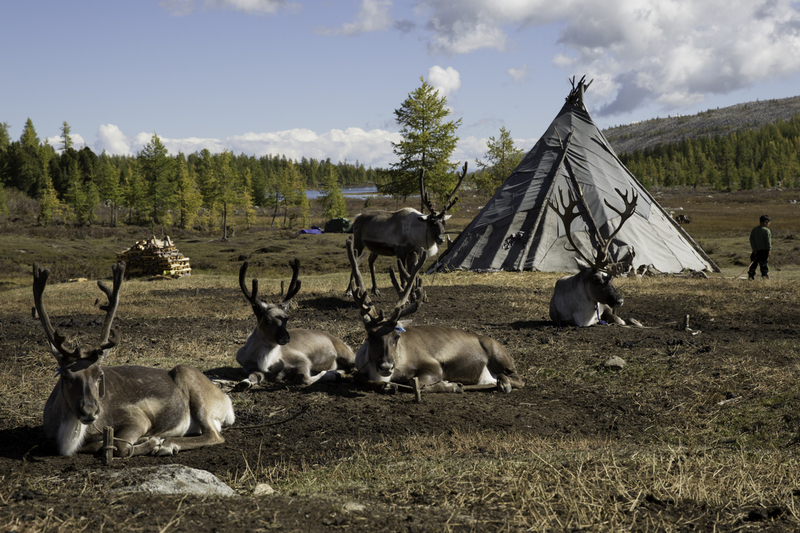 For centuries if not millenia, the Tssachin people have herded reindeer in these norhern reaches, moving with their herds and living in tee-pees transported by the reindeer. Various challenges to their chosen lifestyle have reduced the number of herding families. Ecotourism provides them with supplemental income, though few tourists venture into their realm. KarmaQuest travelers find the experience of spending time with the Tsaachin truly remarkable. They may choose to participate in a ritual with the shaman, an important cultural practice that gives insight into this unique way of life. Travel to the Tsaachins' settlement is best done on horseback, with a full support crew of guides, cook and horse-tenders. En route, you’ll stay in a tent, then shift to tee-pees as the Tsaachin stay, with food provided by your cook. "Amazing dishes came out of our kitchen!" raved recent travelers. 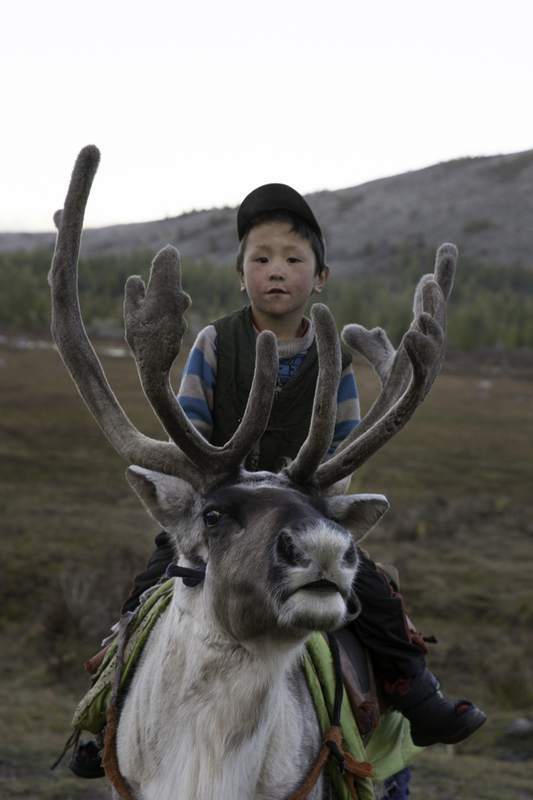 Photos (at left) capture the Tsaachin's everyday life of riding and milking reindeer, complemented by soft autumn lighting that lends magic to the scenes. After four nights with the Tsaachin, you'll continue on through rolling mountains and forests, completing a circular route to a village roadhead before driving 175 miles to Tsagaannuur, from where you'll return to Ulaanbaatar ("UB") by flight. Don't miss the opportunity to see the Golden Eagle Festival. Yes! 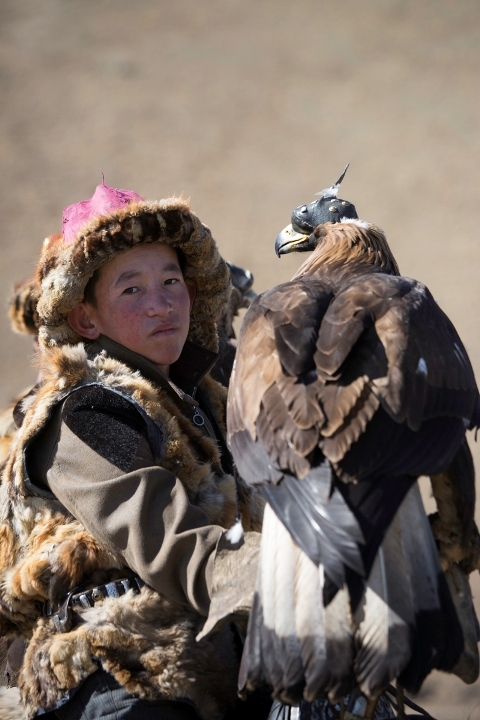 This is the same Golden Eagle Festival portrayed in the film, The Eagle Huntress. Read the "The Untold History of Eagle Huntresses" and a National Geographic interview with the film director, for greater insight into the drama behind the film and story. An optional and highly recommended Extension to the trip takes you to far western Mongolia for up-close encounters with an entirely different ethnic herding people, the Kazakhs. A family of nomads will host your stay in their guest ger (traditional yurt) and show off their eagle hunting and horse-riding skills in anticipation of the annual Golden Eagle Festival -- your next stop on the trip. Join the festival as the hunters parade on horseback in their traditional regalia (photo left) and compete in the lively kekbar games. Eagles also compete for the honor of best hunter, swooping down from high cliffs on their owner's command to fetch an animal skin. Return to UB after a short hike in the Altai, and head home. Other optional extensions (e.g., to the Gobi Desert) are also possible. Please inquire. Day 2 Sightseeing: Get a feel for UB, a modernizing city with a human touch, with a tour of major sights including Gandan Buddhist monastery and the national history museum. In the evening enjoy a traditional cultural performance and welcome dinner. Overnight in a hotel. Day 3 Fly to Murun, the center of Khuvsgul province: Drive some 60 mi to camp in tents at approx 8,000 ft elevation. Day 4 Drive to Tsagaannuur, (approx 125 mi) and explore this provincial center. Overnight in a lodge (approx 9,100 ft). Day 5 Travel by horse-back into the taiga: Today you'll meet your horse guides and get acquainted with your own horse and tack. Pack horses will carry the luggage. This time of year the terrain can be wet and marshy in places, so horses are the best means of travel. They move slowly over the 20-25 miles covered in two days. Being elevated on a horse also provides you with ideal viewing opportunities. Camp in a tent en route, then stay in a teepee. (approx 9,500 ft). Days 6, 7 & 8 Explore the Tsaachin environs: Camp amongst the Tsaachin people, observing and experiencing their everyday life. Activities include attending a shaman ritual, milking reindeers, processing milk products, and learning about their local traditional culture. One day, explore the taiga forest and along the river valley where crystals are found and where locals go for meditation. Day 10 Travel to Tultiin Tokhoi Ger Camp: Drive to Tultiin Tokhoi near Murun town. Stay overnight in Ger Camp on the banks of a river, with beautiful views of the valley and a good chance stretch your legs with a short hike. Day 11 Travel to Murun, fly to Ulaanbaatar: Arrive in UB and enjoy an afternoon to explore on your own. For those not going to the Eagle Festival: say farewell to Mongolia with a special dinner. Overnight in a hotel. Day 12 Departure: Transfer to airport for your departing flight. Free time until then. Trip Cost: From US$3,990/person depending upon group size. Days 1 & 2 (ext) Fly to Ulgii, visit Kazakh family: Early morning fly to Ulgii town (approx 4.5 hrs), the center of Bayan-Ulgii province and drive to Sagsai soum (21 mi). Today and tomorrow you'll be guests of a Kazakh family, tended as well by your own staff. Don't miss this front row seat as the eagle hunters prepare for the festival competition. 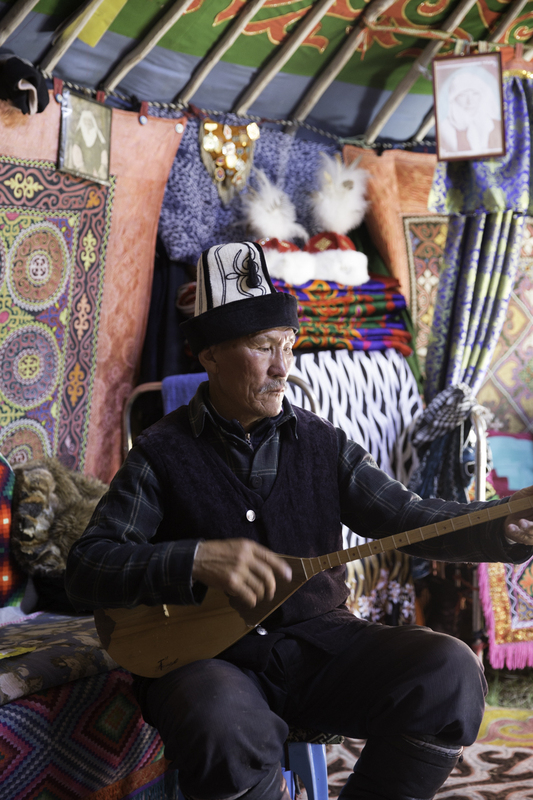 Enjoy Kazakh hospitality and traditional foods including a vast array of dishes made from the milk of their livestock: cheeses, yogurts, and fermented mare's milk or kumis. Overnight in the family guest ger. Day 3 (ext) Attend the Golden Eagle Festival: Travel to the festival site, where the ceremonies begin with the hunters parading on horse-back with their eagles, competing for recognition with their elaborate clothing and accessories. Later the eagles will be evaluated for their speed and agility. In the evening watch a Kazakh concert of traditional songs and dances. Overnight in a Ger Camp. Day 4 (ext) Golden Eagle Festival: On the second day, eagles will be released from a cliff to attack fox skins dragged by their owner on horseback. 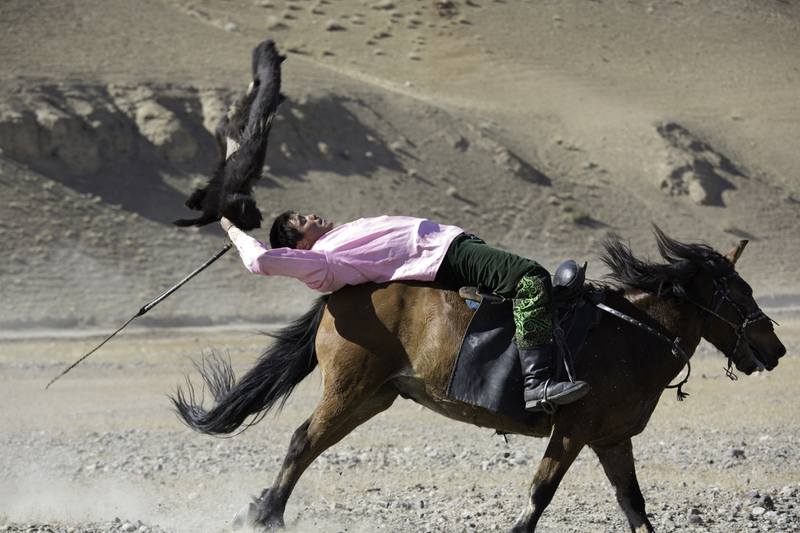 The Kazakhs will compete in their traditional game called “kekbar,” testing their horse riding skills by passing a goat skin amongst their team mates, or wrestling it from their opponents. After an awards ceremoney, enjoy a celebratory dinner. Overnight in Ger Camp. Day 5 (ext) Drive to Tolbo Lake (50 mi) and take a hike into the Khar Sair mountain valley. Overnight in a Ger Camp. Day 6 (ext) Fly to Ulaanbaatar: Transfer to your hotel, with the rest of the day on your own. Overnight in a hotel. Day 7 (ext) Departure: Free time until it is time to transfer to the airport for your departing flight. Please get your deposit in soon as space is limited to 12 persons. The trip may fill up quickly. Deposits are due April 30, 2019; final payment is due June 15, 2019.